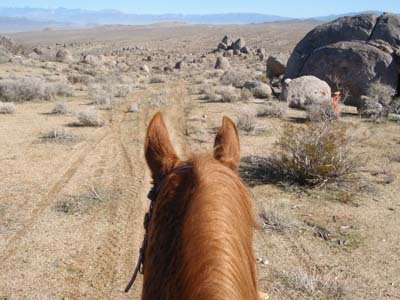 Today Gretchen and I rode her two horses on one of the loops of next weekend's Fire Mountain endurance ride. 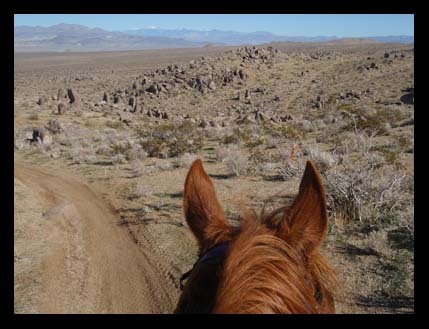 The 50 and 30 mile rides will loop up above Ridgecrest California into the Rademacher Hills, with views of the Sierra Nevada mountains to the west, the Argus range to the northeast, and the Panamint Mountains of Death Valley to the east. I'll name the 14-mile loop that we did the "Pontiac Loop" because we passed an old rusted Pontiac (or something of the sort - I don't have an eye for cars), or should I say, Kav didn't want to pass the old rusted Pontiac beside the trail. It was even scarier than that killer jackrabbit that attacked us. On the trail you'll likely see some of the 40-odd old gold-mine pits and some scattered 'historical trash' from the mining days. 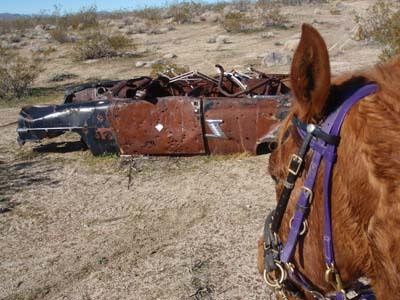 It's a bit early for the burrowing owls to start nesting, but you'll pass some of their nest holes, and you'll surely see some desert Ravens flying about checking you and your horse out. And jackrabbits. Plenty of jackrabbits. It was hot today (about 71 degrees!) and we girls and the two horses sweated up a storm. 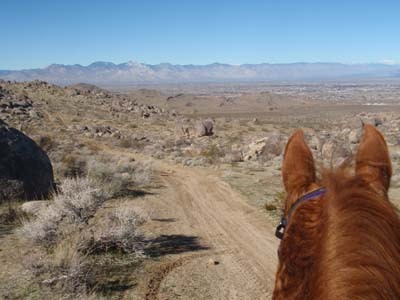 It should be ten degrees cooler Saturday, and the trails are in fantastic condition - very little rock (no pads needed), mostly smooth and soft single and two-tracks, a bit of sand but nothing too deep. The Fire Mountain ride was almost cancelled before the weekend as the number of entries hadn't reached 40. The ride is put on by the local Valley Riders as a fundraiser. The funds don't add up when you lose money putting on a ride. Years past, ride management was turning riders away, but entries are way down this year, as they are in many rides. But by Friday, 38 had signed up, so they gave the Fire Mountain ride the green light. 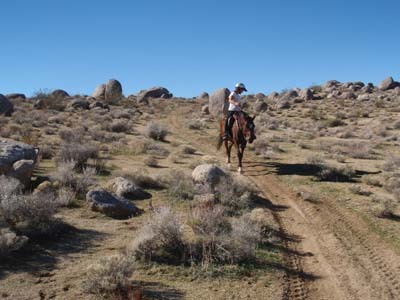 The Ridgecrest area of the Mojave Desert claims to have sunshine 350 days a year. They already got their rain and snow out of the way, so it should be sunny from now till December 31st. The cooler temperature and sunny day will make for some sweet riding on Saturday.